Red Sonja #1 Review – AiPT! Red Sonja has a new #1, a new kingdom, and a new enemy! With all of the various reboots and renumberings for the adventures of Red Sonja over the years, it can be hard to know where to start. Luckily, Dynamite Entertainment has just launched an extremely fun and accessible new take on the Sonja legend! I was personally sold by the words “written by Mark Russell.” I knew I’d be in for something fresh, yet true to the character. That’s exactly what we get in this first issue. Russell’s dialogue is very contemporary, yet it fits the tone of the story. Sonja loses none of her regality and the villains are hilariously despicable. Even if you’re unfamiliar with Sonja, you get a sense of her personality right away. She’s strong, has a sense of duty, and she’s ruthless in a fight. 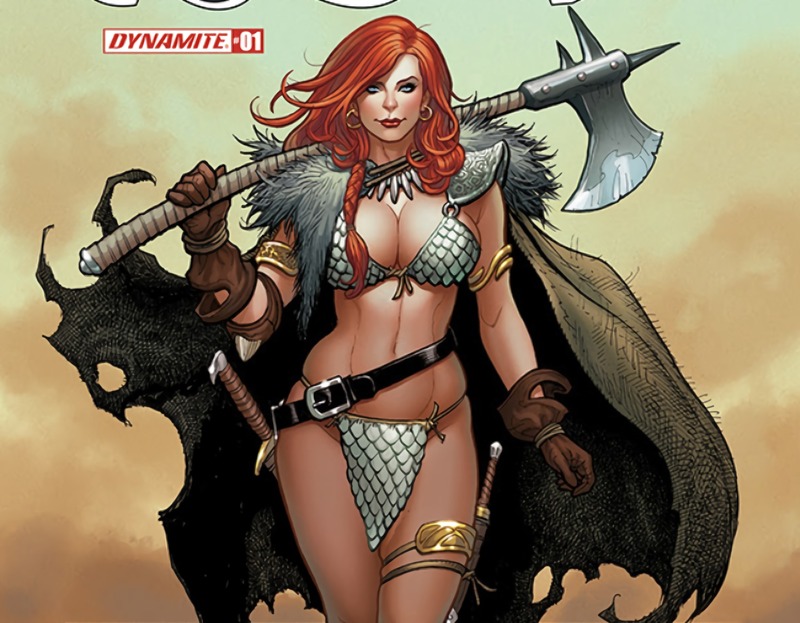 This issue acts as a splendid crash course in many of the elements that make Red Sonja such a compelling protagonist. Mirko Colak’s artwork, much like Russell’s script, feels very modern, yet it also has little touches that evoke the classic Red Sonja comics penciled by Sal Buscema. The action sequences are dynamic and brutal. The landscapes are rendered as gorgeous vistas, where danger hides within each shadow. Most importantly, Sonja is not drawn or written as a sexual object. She’s scantily clad and admired for her beauty, but she’s also feared and respected. It’s a tricky balancing act for any team taking this character on, but it looks like this volume is going to nail that dualistic aspect of the character. Her femininity is not to be exploited nor underestimated, which she makes clear right from the start. As the first issue of a new volume, this issue has the unenviable task of presenting the lead character to potential new audiences and establishing the world in which the series takes place. In this regard, I think the issue mostly succeeds. I’m betting most new readers will be captivated by Sonja’s no-nonsense characterization. There’s a lot of great character work in this issue and it all feels like an organic component of the story. Sonja is a total badass, yet she doesn’t attempt to hide her emotions. She feels everything, and Crom help you if you’re the one foolish enough to make her feel pain. Where the book falters isn’t quite within the content of the issue itself, but rather the fact that it’s marketed as a “fresh start.” As previously mentioned, Dynamite has rebooted the character more than once in the last several years. As a longtime fan of the character, it’s hard for me to suss out if this is meant to be a soft relaunch or an all-new take on the character. There seem to be aspects of each version of Red Sonja incorporated here, but it’s probably too soon to tell. The very idea of the renumbering had me a bit in my head while reading this issue, but that shouldn’t be a problem for any readers being introduced to Sonja with this new #1. I’ve had a similar issue with the many renumberings at Marvel and DC in the last few years, but your mileage may vary, of course. Regardless, my qualms are extremely minor and mainly stem from confusion with the relaunch aspect. The issue itself, however, is a lot of fun. It’s an excellent point to jump on if you’ve ever been curious about the She-Devil with a Sword and never knew where to start!